this jumper is not only a jumper. 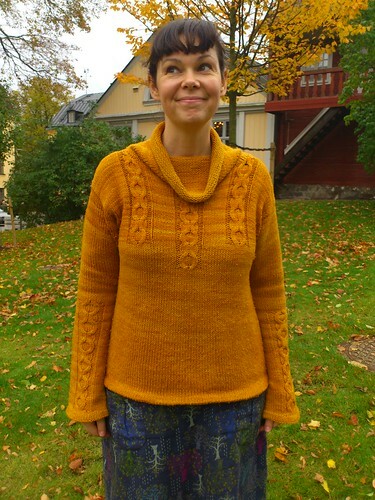 it’s the essence of what i consider a cosy, warm and soft autumn jumper to be. 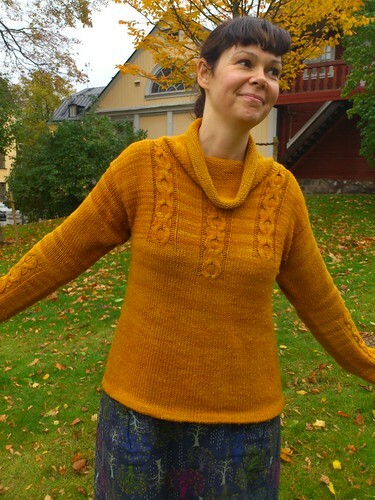 this was supposed to be my autumn 2010 jumper, but finished it this spring. didn’t feel right to blog it until now. 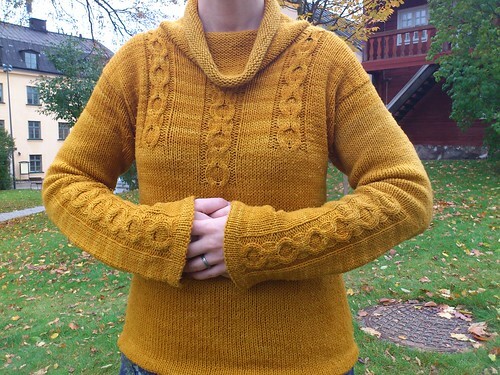 about the mods: i knitted it in the round up to the sleeve openings, then back and forth, but using a smaller sized needle on wrong side rows to avoid a change in tension. then i picked up stitches aroung the sleeve openings and knit the sleeves top down. i didn’t like the sleeve ribbings, and added the same cables onto the sleeves as well. this wasn’t my idea originally, i’d seen someone doing it on ravelry (sorry, can’t rememeber who now – if it’s you, let me know!) and really liked the idea. i didn’t like the rolled edge at the bottom and made a folded edge instead. added the same edge to the sleeves. the yarn is very soft, but only a little wear creates a lot of little bobbles. 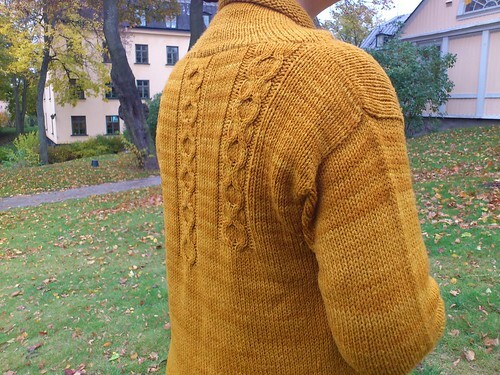 it really is a house jumper, so it’s ok, but i normally don’t like yarn that behaves like this. i’m absolutely smitten with the colour, though! very autumnal. and we all know what i think about that, right? despite the yarn bobbles, i’m very happy with this jumper and i wear it a lot. i should have made the top part of the sleeves slightly narrower, but other than that, it’s great!